Sichuan:Rangtang (Zamtang) Xian. N of the city of Rangtang (Zamtang) on road into Qinghai Province, then along the Maerqu He (Maerqu River) on Sichuan side of river. Remnant forest of Abies, Picea, Betula, Salix and Prunus on slopes above river; Salix immediately along river. 32°40'21"N, 101°6'27"E; 3075-3525 m.
Sichuan: Rangtang (Zamtang) Xian. N of the city of Rangtang (Zamtang) on road into Qinghai Province, then along the Maerqu He (Maerqu River) on Sichuan side of river. 3075-3525 m elevation. 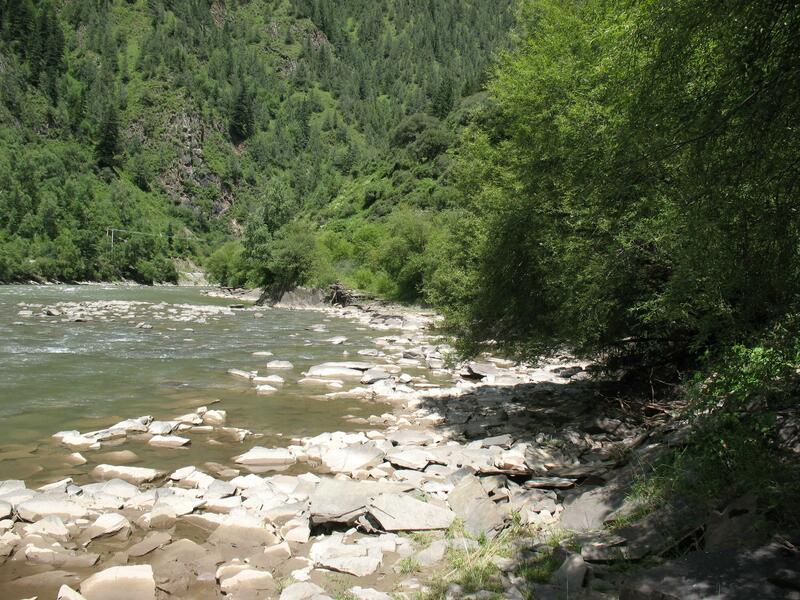 Rocky shore on Sichuan side of river.